Corporation with a capital of more than US$ 8.5 million since it first started operating, Ciment de Mauritanie is the largest cement producer in Mauritania and one of the largest in the region. The company started its cement production in 1981 at Nouakchott the capital city of the Islamic Republic of Mauritania. Ever since it has been operating to win the trust of public and private companies by supplying for big construction projects, such as roads, airports, dams, urban complexes, water towers and etc. Today it has over 450 employees and a fine goods and service quality. Ciment de Mauritanie is also a member of the Board of Directors in the Arab Union of Cement and Construction Materials. Coping rapid expansion, Ciment de Mauritanie grew its workforce gradually over the years. To manage it effectively, the organization took suggestion from Veneta System, FingerTec’s trusted reseller, to deploy biometrics solution. Venete System has been distributing FingerTec’s time attendance and access control terminals in Mauritania and Morocco since 2008. Recognizing that keeping track of their growing employees’ time and attendance can be quite a handful and endless manual process, the management decided to install biometrics time management system. FingerTec TA100CR is a fingerprint attendance solution that requires employees to place their fingerprints on the scanner and the machines will take a couple of seconds to record employees’ attendances automatically. Crooked activities like buddy punching and late comings are some of the many issues that were solved upon the implementation of biometrics solution in the company. For the HR team on the other hand, the recent adaptation was a big bonus as they were relieved from paperwork hurdles and their tasks were significantly lighter, less time consuming and more accurate. Miscellaneous cost spilling due to human errors and callousness are down to the bottom line and the employees are now easy to comply with the work times. FingerTec promotes honesty and in the process, eliminate excessive cost caused by false work hour claims from the staff. 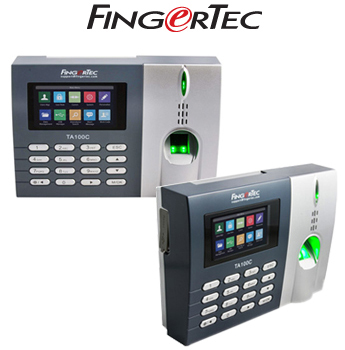 FingerTec TA100CR is a time attendance device, with accurate fingerprint verification method of data collection and FingerTec solutions are suitable for businesses from various industries and sizes. With the bundling of all FingerTec hardware with the processing software TCMS V3, FingerTec has served the worldwide market 16 years to date.